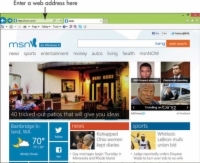 You need to learn how to get around the web using a browser such as the popular Internet Explorer (IE) from Microsoft. If you have Windows 8 or 8.1, you can actually access two different versions of IE depending on whether you open it from the Start Screen or Desktop. 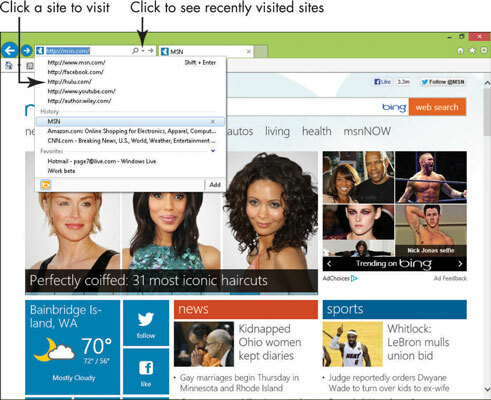 You open IE from the Desktop by clicking the Internet Explorer tile. 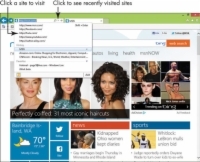 1Open IE Desktop by clicking the Internet Explorer icon in the Windows Taskbar. 2In the Desktop IE, enter a web address in the Address bar. 3On the resulting website, click a link (short for hyperlink; a link takes you to another online page or document), display another page on the site using navigation tools on the page (such as an About us or Contact us link common on most retail sites), or enter another address in the address bar to proceed to another page. A text link is identifiable by colored text, usually blue. After you click a link, it usually changes to another color (such as purple) to show that it’s been followed. 4Click the Back button to move back to the first page that you visited. Click the Forward button to go forward to the second page that you visited. This allows you to go back and forth, as necessary, so aren’t constantly researching the same thing. 5Click the down-pointing arrow at the far right of the Address bar to display a list of sites that you visited recently. Click a site in this list to go there. The Refresh and Stop buttons that appear on the right end of the Address bar are useful for navigating sites. Clicking the Refresh button (it’s a circle with an arrow at the end) redisplays the current page. This is especially useful if a page updates information frequently, such as on a stock market site. You can also use the Refresh button if a page doesn’t load correctly; it might load correctly when refreshed. Clicking the Stop button (an X shape that appears when a site is loading) stops a page you’ve begun to access from appearing. If you made a mistake entering the address, or if the page is taking longer than you’d like to load, click the Stop button to halt the process.